Some kids smile for the photographer, providing their parents with a perfect keepsake for posterity. I love the 'bad' ones, you'll have guaranteed chuckles in the future. LOL!! This is too funny! Did they just take this one shot and say they were done, or did they even try to get her to smile?? It's true you'll smile later. No smile but still adorable. I don't think she was too fond of photographer. She looks a little "displeased". Oh my god, that is too funny. You should let her paint over it, or add some paper collage to it. It reminds me of my sister-in-law's with the crossed eyes or my husband's 4th grade one with the black eye. Awwww! But she is gorgeous just the same! It's really not that bad. 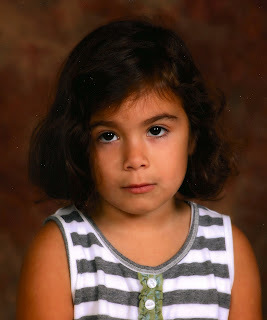 Last year my daughter missed photo day because she was sick...I was so bummed. In it's own special way, it's truly a fabulous portrait! But yeah, you might just want to use a family shot for holiday gifting and display at the grandmas. I don't mean to laugh. But I just can't help it. I looooovvvve it!